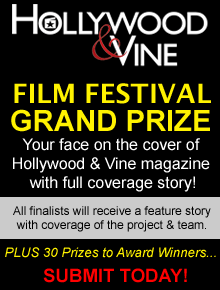 The first annual Hollywood & Vine Film Festival is presented by Hollywood & Vine magazine, the premier entertainment trade publication focused on the business of breaking into Hollywood. The festival is produced by BReaKiNG iNTo HoLLyWooD, a 501(c)(3) non-profit organization founded in 2005 to help artists pursue their careers with creativity, enthusiasm and integrity. The festival's platinum sponsor is ProductionHUB. Other industry organizations and companies are also festival supporters and affiliates.